The scorched nets at S.B. City College’s Sports Pavilion gave testimony to the talent of the Santa Barbara Breakers last Friday night, but the subsequent cooling off showed that the International Basketball League team is a work in progress. The Breakers made 72 percent of their shots while whipping the Seattle Mountaineers, 135-105, in their home debut, but they lost to the same team 24 hours later, 118-113, when they failed to execute down the stretch. The announced attendance on opening night was 1,686, and Pickering said he’s more confident than ever that this professional basketball experiment will prove successful in Santa Barbara. He cited two reasons: The IBL season is not overly long (a tidy 20 games through June), and the timing is ideal for players who want to be invited to NBA tryouts or land international contracts in the summer. 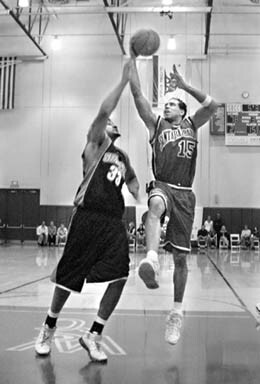 Former UCLA standout Toby Bailey scored a game-high 34 points in the S.B. Breakers' Friday night victory over Seattle. Lavin was sitting Friday with Westmont College coach John Moore, his brother-in-law, and aspiring actress Mary Ann Jarou, his fiancee. The couple will be married in August, and although Moore is part of Lavin’s family, he will take a back seat to Lavin’s best man, another coach of some repute-John Wooden. The Breakers, meanwhile, will be back in action at SBCC on Friday night, April 20, against the Tri-Valley Titans from Livermore. WEEKEND HITS: UCSB clinched a home match in the postseason men’s volleyball playoffs by sweeping USC last week. The Gauchos will host UCLA at 7 p.m. on Saturday, April 21, at Robertson Gym. UCLA has won 99 NCAA championships-19 of them in volleyball-and has been trying to notch No. 100 for the past year. The Bruins soccer team was on the verge last December, but UCSB upset them 2-1 in the championship game. Will the Gauchos frustrate UCLA again? There will be a benefit screening of the movie Quantum Hoops at 11 a.m. on Sunday, April 22, at the Riviera Theatre. Proceeds will go to the B-Rad Fund, which is helping in the recovery of Dos Pueblos High School football player Brad Ebner from a traumatic brain injury. Quantum Hoops, the story of Caltech’s brainy and persistent basketball team, was well received at the Santa Barbara International Film Festival, and director Rick Greenwald will appear at Sunday’s showing. Tickets cost $15 and can be purchased in advance by calling 965-9720 or by email to sbolivers@verizon.net.